Overnight oats are oats you don’t have to cook. Score! All you do is put all the ingredients in a jar, let them sit overnight, and wa-la. You have breakfast in the morning. Take to work, or eat at home. Either way, no cooking required. And for me, that’s a time saver. Plus, you can make more than one serving at a time. Just keep the jar sealed in the fridge. I’ve been creating a bunch of flavors, from my PB&J to Apple Almond, to Chocolate Peanut Butter. I love them all. In fact, I’m kind of addicted to this breakfast. With a new flavor every day, I don’t get tired of it. Packed with so many goodies for my body, I feel great about eating it. 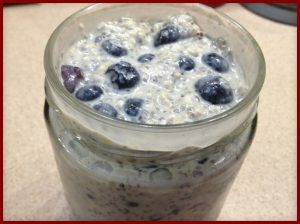 What’s so Good about these Overnight Oats? Oats. We know that oats are helpful with weight loss and maintenance because they are a carb that takes longer to burn off. In other words, you won’t get hungry as fast. Check. 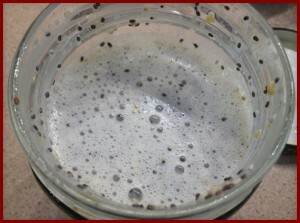 Chia seeds. They live up to the hype. With as many Omega 3 fatty acids as salmon, they kind of blow flax seeds out of the water. Plus, they can be digested whole and don’t oxidize like flax seeds. That means, they don’t go bad as fast and we’re likely to absorb more of their nutrients when we eat them. The big bonus? Chia seeds absorb 12 times their weight in water. This means they help you feel full so you don’t eat as much. Other good fats. Nut butters and chopped nuts add to helping you feel full longer – and satisfied! Lots of fruit. You need your fiber, which you get from the oats, seeds, and nuts. Berries, apples, and bananas pack even more fiber into this awesome breakfast. Little to no added sugar. I usually add sweetness with fruit, unsweetened applesauce, and no sugar added jam. With the chocolate versions, I’ll add a small amount of raw honey. I think that’s ok once in a while. Just stay away from brown sugar and other highly processed or highly refined, high glycemic sugars. Make on-the go single servings or large batches. You can make single servings in your jar, just pull the jar out of the fridge and have a healthy, awesome breakfast on the go. 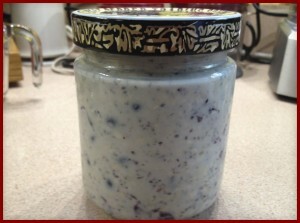 Or you can make larger batches in bigger jars, and scoop servings out as needed. Top with additional fruit or nuts if you want. Eat right out of the jar. Yep, you can eat right out of the jar! This is super convenient for clean-up, not to mention on-the-road and go-to-work breakfasts. Healthy eating can be easy and tasty! Since I got so much good feedback on my PB&J Oatmeal, I decided to start with that recipe – an attempt to transform it into an overnight oats recipe to make it even easier, but just as tasty. Give it a try and let me know what you think! The smaller portion is great for adults and kids. This is even something kids can make. I give a range on the chia seeds because I'm all for more chia seeds, but people who have difficulty digesting seeds should start with less. Get your ingredients and kitchen stuff. 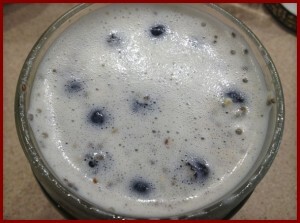 Put all of the ingredients except the blueberries in your jar and shake! 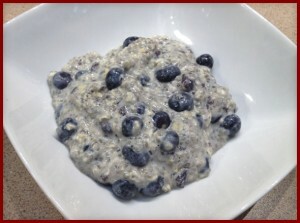 Then stir in the blueberries – gently! Place in the refrigerator for at least 3 hours. But they taste best if they sit overnight. When you wake up, you can sit them out on the counter and let them warm up a little. You can eat them chilled, room temperature, or warmed up. Your choice! You’ll need a 1 1/2 cup glass jar (or larger) for one serving of the larger portion. It’s ok if the jar is too big – the oats still come out great!